Mouse IL-23 alpha & IL-12 beta Heterodimer Protein (ILB-M52W7) is expressed from human 293 cells (HEK293). It contains AA Val 22 - Ala 196 (IL23A) & Met 23 - Ser 335 (IL12B) (Accession # Q9EQ14 (IL23A) & NP_032378 (IL12B)). Mouse IL-23 alpha & IL-12 beta Heterodimer Protein, produced by co-expression of IL-23 alpha and IL-12 beta, has a calculated MW of 20.5 kDa (IL-23 alpha) and 35.8 kDa (IL-12 beta). Subunit IL-23 alpha is fused with a polyhistidine tag at the N-terminus and subunit IL-12 beta contains no tag. The predicted N-terminus is His (IL23A) & Met 23 (IL12B). The reducing (R) protein migrates as 21 kDa (IL-23 alpha) and 45-50 kDa (IL-12 beta) respectively due to glycosylation. Mouse IL-23 alpha & IL-12 beta Heterodimer Protein on SDS-PAGE under reducing (R) condition. The gel was stained overnight with Coomassie Blue. The purity of the protein is greater than 90%. Immobilized Mouse IL23A & IL12B, His Tag (Cat. No. 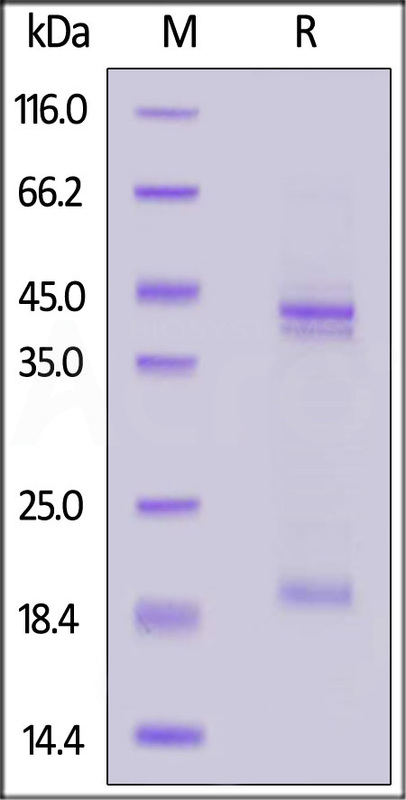 ILB-M52W7) at 10 μg/mL (100 μL/well) can bind Human IL23R with a linear range of 0.078-1.25 μg/mL (Routinely tested). 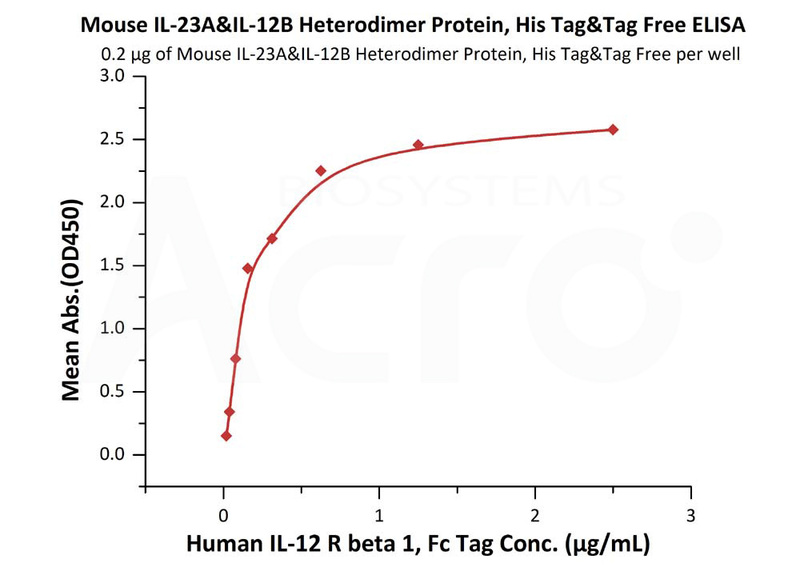 Mouse IL-23 alpha & IL-12 beta Heterodimer Protein (Cat. No. 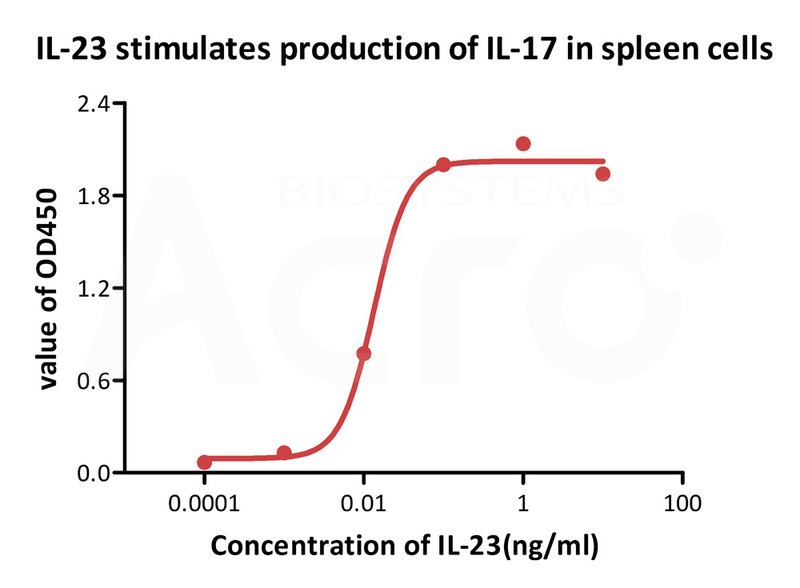 ILB-M52W7) stimulates secretion of IL-17 by mouse spleen cells. The ED50 for this effect is 0.008-0.0134ng/ml (Routinely tested). Interleukin-23 subunit alpha (IL-23 alpha) can associates with IL12B to form the IL-23 interleukin, a heterodimeric cytokine which functions in innate and adaptive immunity. IL-23 may constitute with IL-17 an acute response to infection in peripheral tissues. IL-23 binds to a heterodimeric receptor complex composed of IL12RB1 and IL23R, activates the Jak-Stat signaling cascade, stimulates memory rather than naive T-cells and promotes production of proinflammatory cytokines. IL-23 induces autoimmune inflammation and thus may be responsible for autoimmune inflammatory diseases and may be important for tumorigenesis. (1) Oppmann B., et al., 2000, Immunity 13:715-725. (2) Parham C., et al., 2002, J. Immunol. 168:5699-5708.